HERITAGE FULL DAY SAFARI Departing Daily from St Lucia. "Pick up from your Hotel. Experience South Africa's very first World Heritage Site, iSimangaliso Wetland Park." Travel by Open Game Drive Vehicle into South Africa's very first world Heritage site. The area received world heritage status back in 1999, and has since fast become a top tourist attraction. 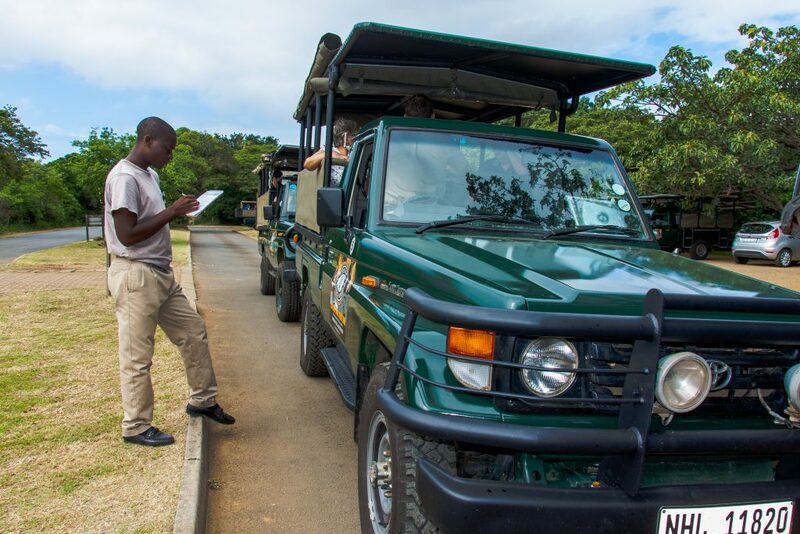 Your ranger for the day will pick you up at your accommodation within the St Lucia area, after a brief introduction to the area you travel into the park. En-route you will have an opportunity to witness first hand just why this area is so spectacular. Its not just the wildlife but the scenery and incredible Eco systems that one may enjoy while on tour. The safari includes numerous loop roads, outcrops, wildlife and then a chance to enjoy Cape Vidal a protected bay, snorkeling or bathing and where you will enjoy lunch. All rangers are knowledgeable and experienced in the respective areas in which they work daily. These men and woman have dedicated their lives to conservation and this shows in the manner which all safari tours are conducted. Their passion for what it is that they do is incredible and we trust that you too will be inspired. Sit back and relax, all game drive safari vehicles are comfortable and safe. Heritage Tours & Safaris only makes use of Toyota Landcruisers and Toyota Hilux vehicles. Use vehicles are the most trustworthy and safe vehicles in the Safari industry. All vehicles are maintained to the highest levels and all vehicles have all of the needed permits and licences as per the South African Transport Act. All vehicles have been designed to offer unobstructed views, hard tops and roll down sides should the weather turn. Each vehicle carries its own first aid kits, extra blankets for those cooler mornings and bottled water. This tour takes place on the Eastern side of the park. During this full day world heritage safari into iSimangaliso Wetland Park we travel through the southern section of park. It's a day of loop roads, hides, lookout viewing points and of course some beach time where you will have the opportunity to snorkel in a protected bay after which you will enjoy a traditional South African braai. The area varies considerably from the second highest vegetated dunes in the world to forest, savanna, mangrove and beach. Migratory Humpback whales in winter to Logger head and leather back turtles in summer. It's truly a place of miracles (iSimangaliso). Not only is iSimangaliso Wetland Park an incredible destination but diverse and beautiful it offers one such an array of wildlife and scenery. From protected bays in which one can enjoy snorkeling and witness large varieties of fish species to resident crayfish and the occasional game fish that enter the bay. Wildlife within the park is also spectacular with both species of Black and White Rhino, Leopard, Buffalo, Hippos, Kudu, Waterbuck and may other other. The area is rich in history, above Catalina Bay from where Catalina's where launched during the second world war offers one some more insight into the history of the area. Venture into iSimangaliso Wetland Park (South Africa’s first World Heritage Site 1999). The area was declared by UNESCO and took place on December 1, 1999. The size 328 000 ha (3,280 km2) of iSimangaliso Wetland Park includes five major ecosystems. This Natural World Heritage Site stretches for 280 km along the northern part of South Africa's East Coast. 4x4 Off-Road, Magnificent Game Viewing, Hides, Bird Spotting, Short Hikes and a visit to Cape Vidal with snorkeling and Whale Watching in season (June to end November). Learn about the Five Ecosystems that make up this park. Experience the Bush, Forest and Beach all in one day! Your experienced game ranger will ensure that you get to the best spots and also learn the unique and diverse landscape that makes this park so splendid. Discover why this area is a world heritage site, from wetlands to Savannah grasslands to mangrove forests, unspoiled beaches and an abundance of wildlife. iSimangaliso means miracle and wonder. The 332 000 hectare Park contains three major lake systems, 8 interlinking ecosystems, 700 year old fishing traditions, 526 bird species and 25 000 year old coastal dunes, the second highest in the world. Animals such as the endangered White & Black Rhino, Cape buffalo, Elusive Leopard, Hippo, Zebras, Red Duiker, Kudu and other animals may be witnessed while out on safari. Birders too will be amazed when they see the amount of birds in the park. Open 4 x 4 Safari Game Drives and Guided Walking Safaris will take you to breathtaking landscapes. Included on this safari outing is a fully catered lunch a south African barbecue. iSimangaliso Wetland Park (St Lucia) is an incredible area to go on safari with an abundance of wildlife not to mention the Leopards that frequent the area. We went on the day tour where we saw even more animals. Senzo was great, very knowledgeable and prepared an amazing lunch for us. It was so nice to hear so much information and facts about the park and the animals in it. Very enthusiastic and knowledgeable tour guides, with lots of information about the animals + environment and very persistent to show all kinds of different animals. Thanks guys, would definitely recommend you and Heritage Tours & Safaris to others. We booked a full day safari with Heritage Tours and were lucky to be hosted by Senzo who had coincidentally hosted our son when he visited in October. Senzo was charming, helpful and really well informed. Not only did he spot lots of animals and birds but he also told us a lot about them. All in all a great way to see some of Africa's wildlife.